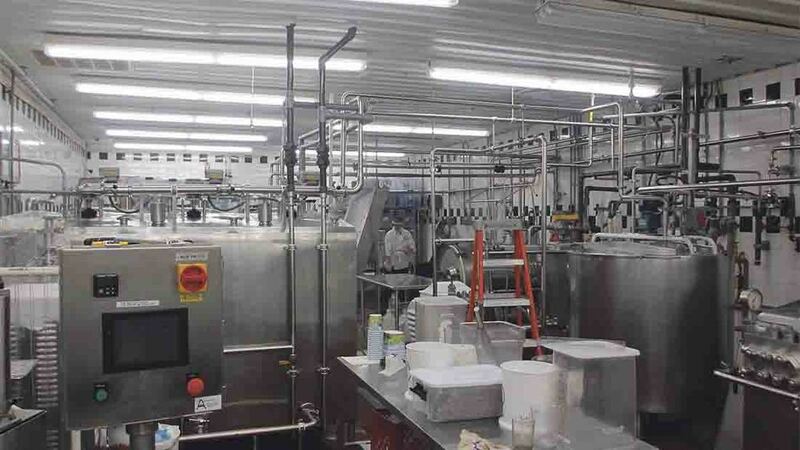 Despite its humble beginnings as a 100-cow dairy farm, the South Mountain Creamery, Maryland, USA, now produces 45.5 tonnes of milk, ice cream, yoghurt and butter a week, to a growing home delivery clientele. John Wilkes reports. Of the 463 dairy units in the state of Maryland, about one-third are located in Frederick County, which is also the setting for the South Mountain Creamery, owned by Randy and Karen Sowers. However, the business, which now includes about 600 cows across 1,000 hectares (2,500 acres), is much more than just a dairy farm. As well as the dairy herds, the business includes beef and pig finishing enterprises, and 17,000 laying hens. All of these service the home delivery service, offered by the creamery, which services 10,000 customers. Of the 450 products offered, 90 per cent are home-produced. The delivery business came about following a slump in the couple’s contract egg-laying enterprise. At its peak in 2000, this included 100,000 birds, but a dramatic decline in egg price threw the viability of the operation into question. This potentially disastrous involvement with contracted production left the Sowers wary. 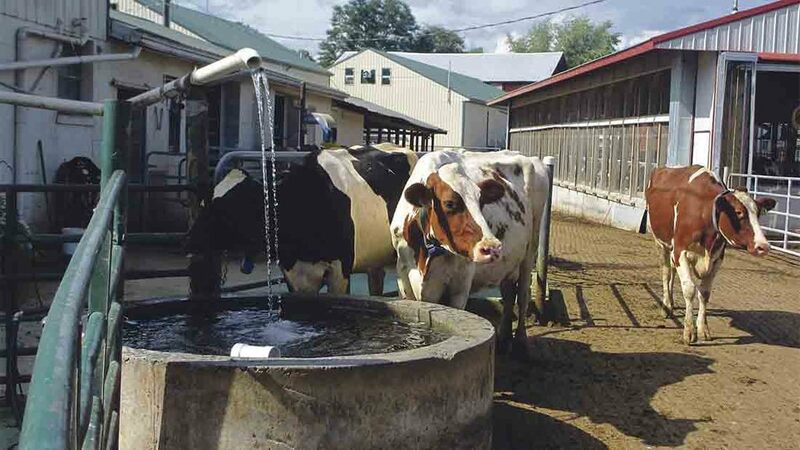 After this experience the Sowers were determined to maximise independent marketing, including their milk, so they investigated on-farm dairy processing and, in 2001, the first on-farm processing plant in Maryland was built and named South Mountain Creamery (SMC). Home delivery began in April 2001 when Karen personally delivered milk to 13 customers. What started out as a complement to their farmers’ market trade has grown to 5,000 weekly home deliveries, stretching from Washington DC to Baltimore, Maryland, and soon to include Philadelphia, Pennsylvania. SMC delivers four days a week by independent contractors using company owned trucks. Distribution freedom does not come cheap, explains Randy. Cost to service their home delivery customers is £1.2 million per annum, inclusive of wages, insurance and vehicle maintenance. In addition to 70 full-time staff, son Ben and daughter-in-law Kate are partners in the business. Their four young children are already showing keen interest, too. While the couple’s families were involved in the dairy industry in the past, both Randy and Karen initially worked outside of the industry; Randy was an electrician and truck driver, and Karen worked in a school library. However, Randy left his job in 1981 to return to dairy farming. The couple rented machinery and 65ha (160 acres) of land, taking out a bank loan to buy 100 cows. Locust Valley Farm; and 220 cows at the recently bought Bushey Park farm, where cows are milked twice a day through a 16:16 rapid-exit herringbone parlour. Karen and Randy are still heavily involved in the day-to-day running of the herd at the creamery site and run the 1:30am milking shift, with farm staff handling the 1:30pm milking. Here the herd is 95 per cent Holstein. A small number of Jerseys have been introduced in order to increase butterfat, and Brown Swiss genetics have also been used to produce a ‘sturdier cow’. “The Holsteins had become pretty but not sturdy enough. We tried crossing with the Swiss to build them up” explains Randy. However, he says the Brown Swiss numbers will remain relatively small. These cows calve all year to ensure a continuous supply for processing. Freshly calved cows are moved from the Sowers’ other two units when needed. The herd’s dry cows and 375 followers are managed separately. An average yield of 9,700kg is achieved over a 305-day lactation with a diet based on home grown forage. This includes a portion of the 485ha (1,200 acres) of maize crop which is chopped for silage, as well as forage from 162ha of lucerne and hay. Current daily production is about 32kg at 3.85 per cent butterfat and 3.15 per cent protein. Somatic cell count is about 225,000 cells/ml and attributed to the liberal use of hydrated lime. Son Ben has a robust view on the depressed state of US milk prices, which stand at $14 cwt/gallon (23p/litre). Skimmed milk is then fed to 100 fattening pigs and, to add to the mix, progeny from a 90-cow Aberdeen–Angus and Hereford cross cow suckler herd are finished on-farm along with about 200 dairy beef steers. The resulting beef and pork is sold via the home delivery, as well as eggs from the 17,000 laying hens. Mr Sowers says SMC enjoys a distinct competitive advantage with the freshness of its milk. Combining freshness with the American consumers’ insatiable demand for convenience and it is easy to see why SMC’s wide following is still growing. Popular items also include ice cream, which is produced consistently year round. About 90 per cent of this sells via home delivery and 10 per cent through a limited number of wholesale outlets, including the SMC farm store which turned over £460,000 in 2015. Surplus milk goes to Maryland and Virginia Milk Producers Cooperative Association. South Mountain Creamery’s inventory is a model of vertical integration, giving it the competitive edge over 20 other farm delivery and artisanal ice cream enterprises which have proliferated regionally since the operation began. This confidence led to a £17 million expansion investment in 2015, buying Bushey Park Farm. The 607ha (1,500 acres) of excellent quality land consisted three units which the owner would not split to sell. Considerable expenditure went into construction of a modern dairy in an extensive new barn constructed by the previous owner. 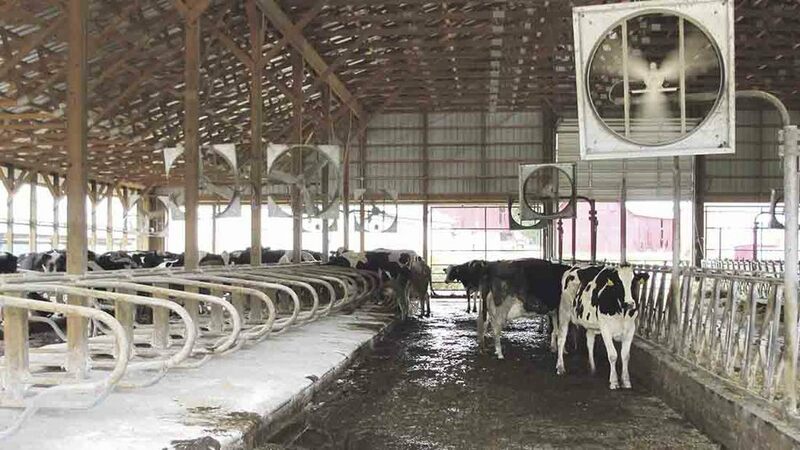 The empty space was capable of accommodating a rapid-exit parlour and extensive cow cubicles which use sand bedding. A grant aided a £500,000 lagoon with a sand lane, and recycling system is nearing completion, with most work done in-house using SMC’s own heavy plant machinery. 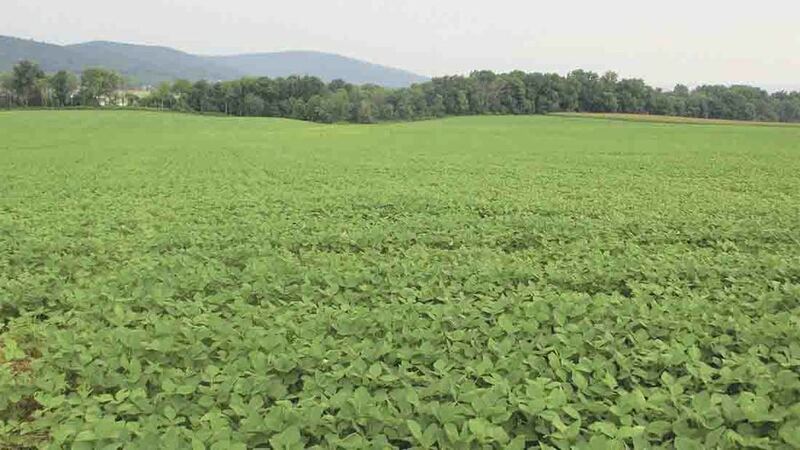 Like the Sowers’ two other farms, Bushey Park lies in the Chesapeake Bay catchment area and is subject to stringent bio-solid management regulations which mandate soil testing and nutriment management planning. With considerable land now available at Bushey Park, the long-term goal is to significantly expand the 220-cow operation to 800 head and potentially move the robotic milkers on-site. Moving forward, this commitment holds little fear for the Sowers. They have positioned themselves early to take advantage of the growing movement for locally produced food and home delivery. As such, they are well placed to meet future challenges. The magnitude of their recent investment does not appear to keep Randy and Karen Sowers awake at night, they are far too busy milking cows.